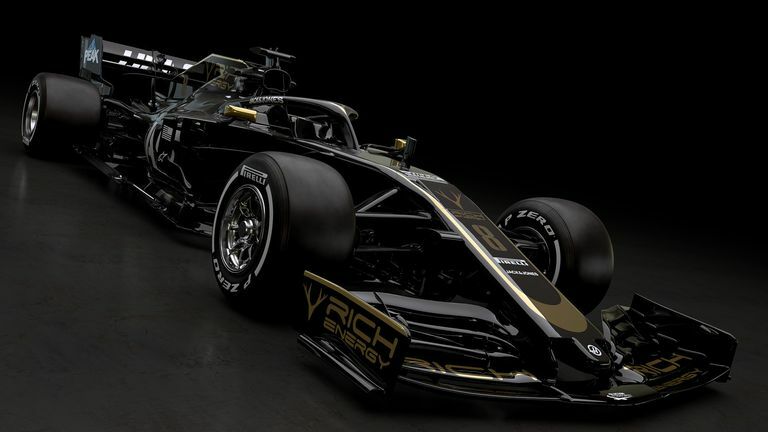 The dramatic colour change for the American-owned team comes on the back of a title sponsorship deal with Rich Energy, a British energy drinks company. The firm has targeted challenging Red Bull "on and off track". The new look was unveiled at an event in London, although Haas' actual 2019 car was not revealed. The VF-19 will instead be seen for the first time at winter testing later this month. "This is the time of the season when you hope you've got designs right and you can be competitive straight away," said Gene Haas, Haas F1 founder and chairman. "The new car looks distinctive, not only in terms of its colour scheme, but also with the new regulations in play. Hopefully those design changes brought in for 2019 will improve the racing on-track, and more importantly give us a shot at making more of an impact at each Grand Prix." Haas are one of only two teams to retain their driver line-up from last season, with Romain Grosjean and Kevin Magnussen in tandem for the third campaign in a row. The Banbury-based team enjoyed their best-ever F1 season last year, just missing out on fourth after a close battle with Renault, and have improved in every campaign since joining the sport in 2016. William Storey, the chief executive of Rich Energy, grabbed headlines at the launch by saying: "We're looking forward to taking Red Bull on both on and off the track", with his company competing in the same energy drinks market place as Red Bull. "Formula 1 is a wonderful platform for us and we're with the best run team in my opinion and, equally importantly, lovely people," said Storey. "We're delighted to work with Haas and we want to do it on a very long-term basis." Storey added: "Red Bull are a brilliantly-run business, Dietrich Mateschitz is a very clever guy and created a category in 1987, but we feel we have a better product and a better brand. We feel we have a really good opportunity to beat them, off the track." Asked if challenging former champions Red Bull on the track was an achievable ambition, team principal Guenther Steiner added: "You have to try hard. If you have no targets you never achieve anything. The return of black and gold to Formula 1... Haas' new look for 2019. What's changing on the F1 2019 cars? The rear wings can also now be fitted with a higher flap - which could increase the strength and power of DRS by 25%. Get Sky Sports F1 for 2019! What's in an F1 livery?